"Many examples drawn from the author’s experience of engineering applications are used to illustrate the theoretical results, which are presented in a cookbook fashion...it provides an excellent practical guide to the analysis of product-life data." 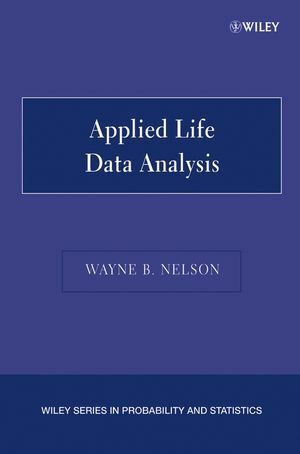 Now a classic, Applied Life Data Analysis has been widely used by thousands of engineers and industrial statisticians to obtain information from life data on consumer, industrial, and military products. Organized to serve practitioners, this book starts with basic models and simple informative probability plots of life data. Then it progresses through advanced analytical methods, including maximum likelihood fitting of advanced models to life data. All data analysis methods are illustrated with numerous clients' applications from the author's consulting experience. American Society for Quality awarded Dr. Wayne Nelson of Schenectady, New York the 2003 Shewhart Medal. The Medal honors his outstanding technical leadership, particularly for innovative developments and applications of theory and methods for analyzing quality, reliability, and accelerated test data, and for widely disseminating such developments through his books and many publications, talks, and courses. The Shewhart Medal for outstanding technical leadership is named after Dr. Walter A. Shewhart, who pioneered statistical methods for controlling and improving the quality of manufactured products. These methods contributed significantly to the United States' war effort in World War II. Subsequently taken to Japan by Dr. W. Edwards Deming, these methods revolutionized Japan's industries. Today these methods are part of widely used Six Sigma training on how to improve the quality of products and services. The American Society for Quality is the world's largest professional society dedicated to the improved quality of products and services. It serves its members and the public through a variety of educational activities, including conferences, training courses, journals, and books. Dr. Nelson is a graduate of the California Institute of Technology (Caltech) and the Univiversity of Illinois. Formerly with GE Research & Development, he now privately consults and gives courses for companies, professional societies, and universities. For his technical contributions, he was elected a Fellow of the American Society for Quality, the American Statistical Association, and the Institute of Electrical and Electronic Engineers. He recently spent four months in Argentina on a Fulbright Award, lecturing on analysis of product reliability data. 2. Basic Concepts and Distributions for Product Life. 3. Probability Plotting of Complete and Singly Censored Data. 4. Graphical Analysis of Multiply Censored Data. 5. Series Systems and Competing Risks. 6. Analysis of Complete Data. 7. Linear Methods for Singly Censored Data. 8. Maximum Likelihood Analysis of Multiply Censored Data. 9. Analyses of Inspection Data (Qualtal-Response and Interval Data). 10. Comparisons (Hypothesis Tests) For Complete Data. 11. Comparisons with Linear Estimators (Singly Censored and Complete Data). 12. Maximum Likelihood Comparisons (Multiply Censored and Other Data). 13. Survey of Other Topics.